So, Barrack Obama chose Hilary Clinton as his Secretary of State. This is not surprising to me (not the actual choice of S.O.S, but the fact that Hilary would become a key part of the new Obama administration) and I am not overjoyed or outraged by this pick. Hilary is a sound choice for Secretary of State. There are some out there who may disagree with this (especially out there in the blogosphere). Some point to her vote for the war in Iraq. Still others still have the 3am phone call ad fresh in their memories. Of course there was also her constant hammering of the point that Obama was inexperienced (especially when it came to foreign policy). 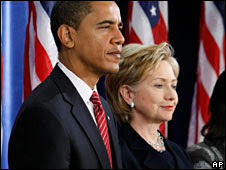 Those may be valid arguments against Obama choosing Hilary for the position, but no one can say that she is not qualified for the job or that Obama will be president and therefore her boss (and the final decision maker). We should not blind ourselves by our dislike for a person and ignore that person’s qualifications for the job. Are there better people out there for the job? Some can be argue that there are, but by that same logic some can argue that there are better people out there for the job of POTUS. My point is that our next president has decided that Hilary was the best fit for that position in his administration (just like we decided that he was the best fit for the position of POTUS). Now I don’t know about anyone else, but one of the factors that led me to vote for Obama was his judgment and informed decisions. I am well aware of how much of a fool Hilary was acting during the primaries, but if Obama can let bygones be bygones then so can I. The man has not given me a reason to doubt his judgment before so I will not do so now ( I’m not saying that I’ve partaken in the kool-aid, just that I will wait and see how his choices pan out, before I make declarative statements). I’m sure there will be mistakes and missteps in the future, but I sincerely don’t believe that this is one of them.